Being a work-study at Berklee definitely has its advantages. I’ve learned about many services offered by the school I would not have known about otherwise. One of my favorites is Lynda.com! It is a web site that offers different tutorials and many different types of software. After spending months at my internship updating the extensive File Maker Pro database the company uses, I decided that I wanted to learn more about how FileMaker works. Since I’m going to be an official college graduate in less than two weeks, I wanted to make sure I was taking everything Berklee offered for the last time. I started looking up FileMaker tutorials on Lynda.com. While many people may find this boring, I was completely enthralled by everything that was available to me in FileMaker. When people say it’s Excel on steroids, they’re not joking! I wanted to think of a way to apply my newfound skills in a way that would benefit me. After about a week of job hunting I was overwhelmed by all of the job openings I had found. Granted, things are still competitive but I am applying for anything and everything. 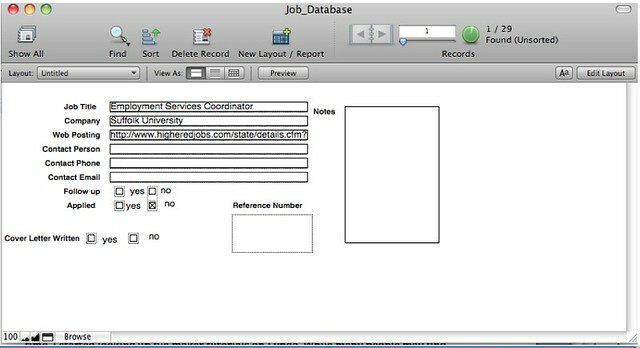 I decided that the best way to keep everything straight would be to make ye very own FileMaker job database. I made the entire database from scratch. It includes boxes for the job title, the company, and even check boxes for a written cover letter or application status. It has been extremely helpful to me. Not only do I now know how to create a (very basic) FileMaker Pro databases but I also feel more in control of my job search. Berklee students, staff and faculty can access Lynda.com training for free via their berklee.edu accounts. Using your Berklee Username and Wireless Pin, log in. Arielle Schwalm is a Music Business / Management major interning in Boston for the Fall 2010 semester.